We’d love your help. Let us know what’s wrong with this preview of City of Fate by Nicola Pierce. Imagine your home is bombed one Sunday afternoon by a horde of enemy planes. Imagine your family has gone and you are left behind. This is the fate of five-year-old Peter and two teenagers Yuri and Tanya. Imagine being ordered to leave school to fight the terrifying Nazis in WWII. Imagine you are right in the middle of a battle; it’s you or them – you have no choice. This i Imagine your home is bombed one Sunday afternoon by a horde of enemy planes. Imagine your family has gone and you are left behind. This is the fate of five-year-old Peter and two teenagers Yuri and Tanya. Imagine being ordered to leave school to fight the terrifying Nazis in WWII. Imagine you are right in the middle of a battle; it’s you or them – you have no choice. This is the fate of Vlad and his three classmates. The battlefield is the city of Stalingrad, the pride of Russia. Germany’s Adolf Hitler wants the city badly, but Josef Stalin refuses to let go. To ask other readers questions about City of Fate, please sign up. The battle of Stalingrad is the setting for this Children's/ YA novel by Irish author, Nicola Pierce. We have all read the familiar accounts of children's experiences in WW2 but these stories tend to based around Germany and the Nazis. This book looks at the effects of war on the children and families of Russia. Peter is found wandering the streets, orphaned and afraid. Yuri has lost his family also, and takes Peter under his wing. They spend their time hiding from the Germans and searching for The battle of Stalingrad is the setting for this Children's/ YA novel by Irish author, Nicola Pierce. We have all read the familiar accounts of children's experiences in WW2 but these stories tend to based around Germany and the Nazis. This book looks at the effects of war on the children and families of Russia. Peter is found wandering the streets, orphaned and afraid. Yuri has lost his family also, and takes Peter under his wing. They spend their time hiding from the Germans and searching for food. We also learn of the fate of schoolboys forced to join the Russian Army despite their young age, and lack of understanding of the war and what it entails. The author combines these two angles very well, in basic english, making it the ideal read for children from 10 years plus. There are some harrowing tales within the book and the idea that they are based on fact makes it all the more shocking. 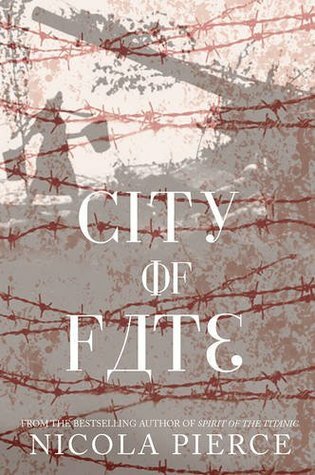 Reading City Of Fate should be a great benefit to any kids who are interested in World History and would be ideal as a read aloud book for teachers. Sometimes children’s fiction can be entertaining. Sometimes it can be thrilling and gripping. Sometimes it can be thought provoking and challenging. Sometimes it can be realistic and educational. And sometimes (but rarely), it can be all these things together. City of Fate is one of those books. My Thoughts on City of Fate. This book is aimed at children from 10 upwards and as an adult I thoroughly enjoyed it also. It is set in Russia during World War II and does an excellent job in portraying the futility and brutality of war. The characters are ordinary children and teens shoved into horrific circumstances and forced to be extraordinary. Even if you don’t know much about the Russian setting, it is built up nicely for you and you are thrust head first into the action along with the very first bomb. The language used is dark and threatening and it envelopes you in the terror that must have stuck in the hearts of all. Some characters are more likeable than others but it all heightens the knowledge that war affects everyone. The brave, the weak, the bullies; all are tested and survival becomes the key focus. Yuri (age 14) and Peter (age 5) are left without family and without homes and together they attempt to live, eat and sleep hour by hour, day after awful day. Yuri is often hit with uncomfortable truths and has to learn to cope with the unthinkable without any adult to help him make sense of it. Vlad, Leo, Misha and Anton (age 16) go to school only to find out that they have to report for duty that very night and are now soldiers. The loose friendships between them become a bond and give them a sense of home when they are far from home. Through their inexperience; you get a sense of how jumbled and confusing this war was. You also see how acts of patriotism can be acts of cruelty depending on which side of the fence you are on. I think this book is very powerful and would make a great discussion book if you read it with a pre teen. And I would recommend doing just that as the book is dark at times and I think the themes should be explored and explained. I love that the book is so realistic and doesn’t gloss over the details but again I want to emphasise if a younger child is reading that you should chew it over with them. The book is also a hopeful one and at times when the language and actions are at their darkest; you get a reminder that life goes on and there is always hope. Music and nature is used to great effect to portray this hope and adds a sense of longevity and endurance to the story. Overall; I’m hugely impressed with this one. I loved how historically accurate it is but I also really loved all the themes running through it. It isn’t a light read but it is a worthwhile one. The epilogue felt a little out of place for me as it felt like we left the book and the author was speaking directly to us. I didn’t hate it but it didn’t work as well as the rest of the book for me. Who should read City of Fate? I’d highly recommend this book to fans of historical fiction whether you are a child (over 10), a teenager or an adult. Especially if you like books that focus on younger characters but don’t gloss over the details. It’s a stark reminder of darker times. Thanks to The O’Brien Press for giving me a copy of this book in exchange for an honest, unbiased review. A review copy was provided by The O'Brien Press in return for an honest review. If you read the blog regularly you'll know I don't read a lot of YA. It's not a case of snobbery. More a case of me feeling I cant really connect with the story or the characters. This was not the case here. I love when YA books take on more difficult subjects like this. I hope that doesn't sound condescending because its not meant to be. I just feel that contemporary YA strikes more of a cord with me than fantasy or paranormal based YA. City of Fate is a story of we all deal with change, loss and our own (often flawed) perception of others. We meet Anton, Vlad and Leo as they are reluctantly led by their teacher to sign up to fight for their country. Like a hangman leading a prisoner to the noose he watches young boys (mere children really) sign what are, essentially their own death warrants. Feeling the need to appear braver than the masses Anton immediately takes the lead. Although he initially appears boorish and cocky he actually becomes the rock of the group, the voice of reason in chaos and the most courageous in times of fear. He turned out to be one of my favourite characters in the book . On the other side of the city Yuri and Peter are alone in the world. They survive day by day on the scraps of war. They meet Tanya, a brave young woman who is determined to see life after this horrendous war that has torn her beloved city apart. Tanya is a completely selfless person she works, cares for her mother and thinks nothing of taking on two more mouths to feed. Every character in City of Fate are is confronted by their own prejudices. They see themselves reflected in the actions of the "enemy" and they begin to see war in its simplest form: humans killing other humans. The two groups meet in a heartbreaking conclusion in which there are no winners, only losers. I don't want to stifle the reach of this book by saying it's perfect for younger readers because it really will appeal to readers of all ages. In conclusion City of Fate is an emotional story about what really makes us human. My love for World War Two literature is never ending and I was particularly pleased to have the chance to read about the battle of Stalingrad and the people trying to live whilst it’s going on. Completely fascinating and not a subject I know in depth it is very clear that Pierce has researched and researched to ensure every element of this novel is believable and every character is genuine. There are parts of this book that are hard to read as we meet characters who have had their nerves destroyed and their mental state is far removed from their normal. The moment Yuri is forced to leave his mother and baby sister is heart-breaking, Pierce talks about his family in ways which make you want to pick them up and take them anywhere else, away from the terror of the battlefield. At Stalingrad there were nearly 2 million killed, civilians and soldiers. Pierce doesn’t shy away from the brutality of it all and even with the young age of her audience she simply tells a story. As well as Yuri we have Peter, who at just 5 years old gives another dimension to the story, more innocent and naïve and Vlad, a teenage soldier who, despite bravado, sees and hears things no child should have to see. As the battle commences so does the connection between Vlad, Yuri and Peter as Pierce’s plot cleverly brings them together and then bang, in a horrible, harrowing climax, it’s all over. There are no happy endings because it would ruin the authenticity of Pierce’s story. I didn’t expect the end to be quite so brutal but, I think because it is the story has stayed with me for longer and I have a powerful sense of the injustice of war and a deeper understanding of the Battle of Stalingrad. Although the novel sounds dark there are moments of light relief, adding humanity, with scenes of spying on Nazi soldiers particularly heart-warming, although when put like that it sounds pretty terrifying. I would love to read more of Pierce’s work. A fantastic read. I knew nothing about the Battle of Stalingrad and this book sparked my interest. Credible characters and story-line as well as carefully set sense of time and place all add to make this book unputdownable. I loved it!